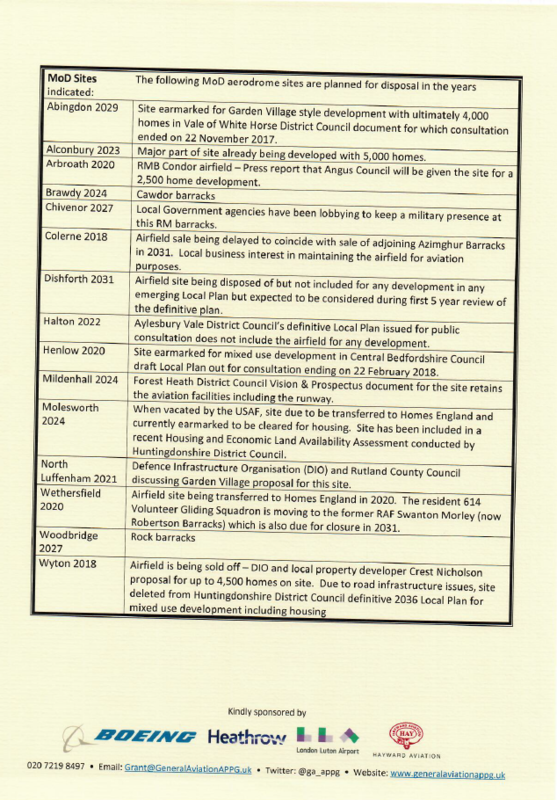 The All-Party Parliamentary Group (APPG) on General Aviation has sent a comprehensive list of the airfields under immediate threat of closure to the Aviation Minister Baroness Sugg. In a letter accompanying the ‘Airfields in Danger’ list, created and maintained by AOPA, the Parliamentary Group warns that there is still “a long way to go” before the General Aviation sector, and the important contribution it makes to high-tech jobs and growth in the economy, is properly protected. 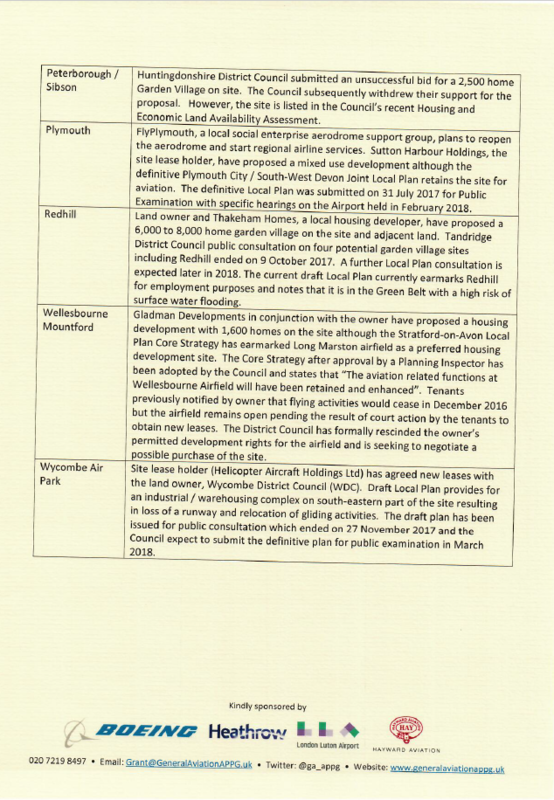 The letter to the minister, which can be read in full below, comes in the wake of a welcome change to the National Planning Policy Framework which seeks to recognise General Aviation in the planning process for the first time ever. 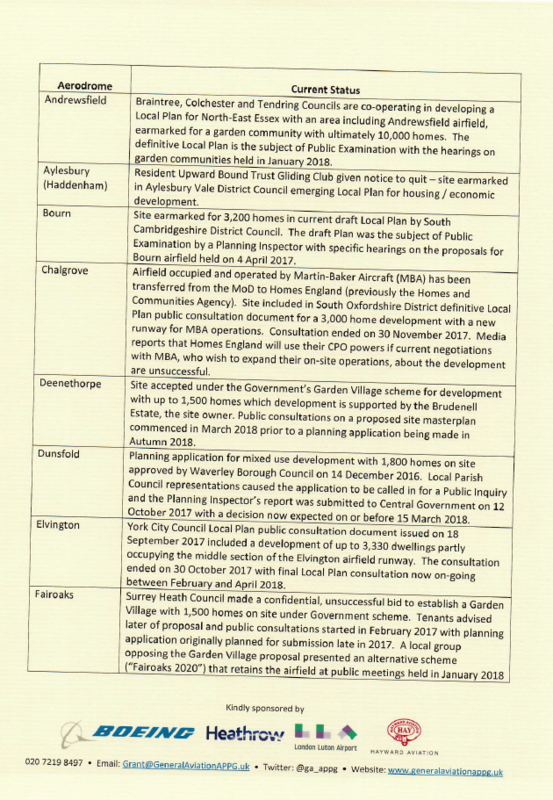 Draft paragraph 105(f) has been welcomed by aviation planning experts, but the APPG believes there is still more to do and is proposing further NPPF changes during the current consultation. 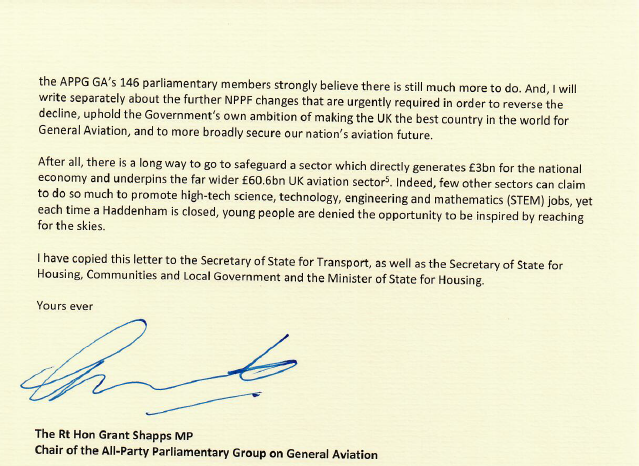 Commenting on the letter to Aviation Minister Liz Sugg, Chair of the All-Party Parliamentary Group on General Aviation, Grant Shapps MP said: “Decades of government neglect has led to just 100 licenced airfields still available to General Aviation. To their credit, this Government has started to take the matter seriously. 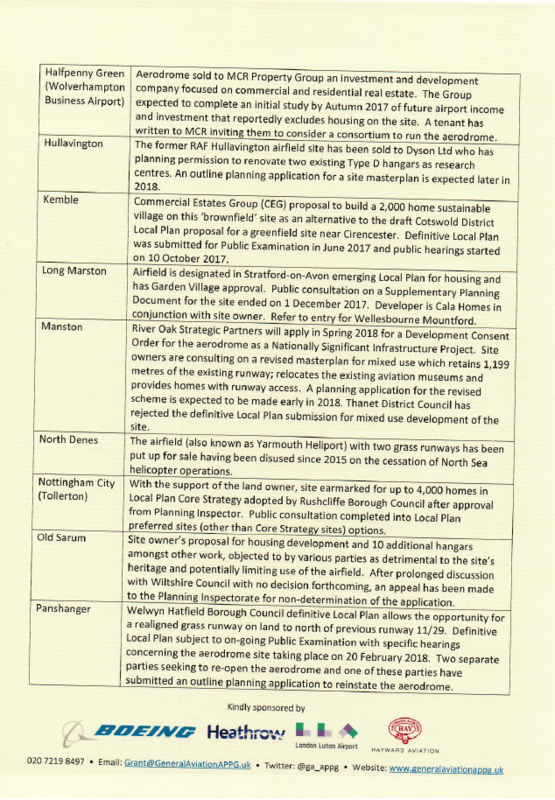 The draft change to the National Planning Policy Framework will help, but it doesn’t go far enough. 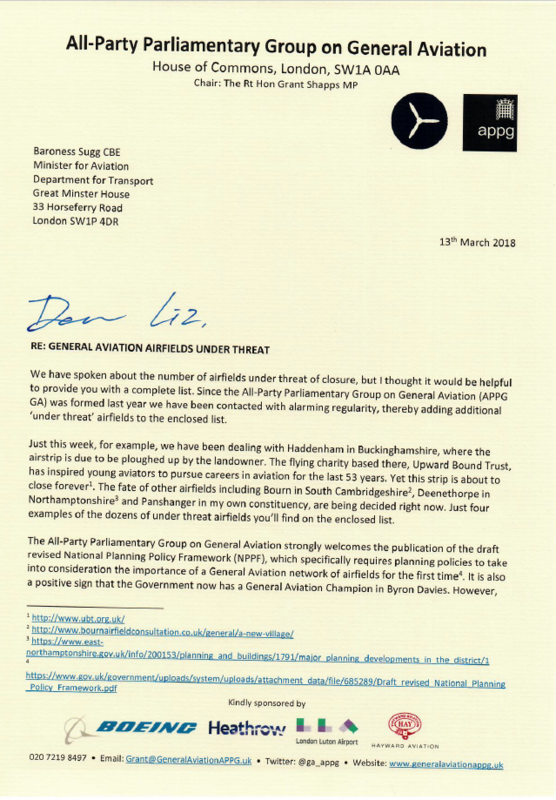 “That is why we have written to Baroness Sugg to highlight just how many airfields are under imminent threat of closure, and it’s the reason why we are proposing further changes to the NPPF in order to reverse this downward trend. Transport Ministers Chris Grayling and Baroness Sugg have been fighting the case for General Aviation in Whitehall. And in recent weeks industry stakeholders and representatives from the APPG have held roundtable talks with Baroness Sugg in the wake of the Government’s announcing its first General Aviation Champion in former MP Byron Davies. General Aviation directly generates £3bn for the national economy and underpins the far wider £60.6bn UK aviation sector, as well as providing jobs for 38,000 people in high-tech science, technology, engineering and mathematics (STEM) roles. Revised National Planning Policy Framework text now includes new Paragraph 105(f) saying planning policies should “recognise the importance of maintaining a national network of general aviation facilities – taking into account their economic value in serving business, leisure, training and emergency service needs, and the Government’s General Aviation Strategy”.